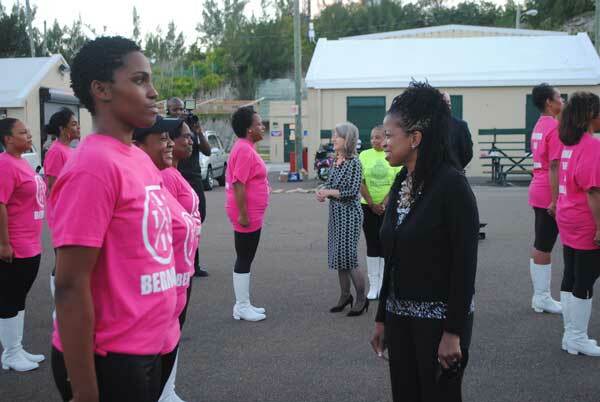 A new women’s rifle drill team set to make its debut at the annual Bermuda Day parade has got a seal of approval from the wives of Governor George Fergusson and Premier Craig Cannonier. Margaret Fergusson and Antoinette Cannonier joined forces to inspect the ‘troops’ of the Bermuda Rifle & Drill Team, formed by Regiment Sergeant Debbie Symons and who are being trained by Bermuda Regiment drill instructors. Ms Fergusson [centre right] and Ms Cannonier [centre left] line up with the new Bermuda Rifle & Drill Team at Warwick Camp. And Ms Fergusson said, “I just commend the initiative – I think it’s absolutely fantastic that Sergeant Symons has formed a group of women with a mix of age groups, some with children, families and other interests. Ms Fergusson was speaking after the drill team, which is mostly civilian, was put through its paces and inspected by the dignitaries last week. The 25-strong team will perform in public for the first time in the Bermuda Day Parade and plan to fly the flag for the Island at a major parade in Chicago later this year. Ms Cannonier added, “I’m very impressed and I’d like to congratulate the ladies for making this all come together. It’s a great opportunity for teamwork, fitness and to learn something new. And she praised the Regiment for backing the team with training in drill and parade ground manoeuvres. Team manager Sgt Symons added that the team had been given the honour of stopping at the Bermuda Day reviewing stand at the Flagpole on Front Street for an official salute. She said, “Both Ms Fergusson and Ms Cannonier heard about the group and they said they’d like to come up and meet the team. “It’s a big thing for them to come and we’re delighted. It’s all going very well – the team is switched on and they’ve got the steps down. And she appealed for sponsors for the team to help them reach their goal of performing in front of thousands in Chicago in August. And he said helping civilian organisations helped to demystify the Regiment and gave them a better understanding of its training and value. Anyone interested in helping sponsor the team should contact bermudarifles@hotmail.com or contact the Regiment on 238 1045. A fine testament to Bermuda’s Powerful Women. Thank you ladies for proving that we can cooperate, depend on each other, execute tasks with critical timing, be strong, beautiful, muscular and in demand. It would be nice to see the team become truly representative of the rainbow of nationalities in the island. Please keep up the good work.